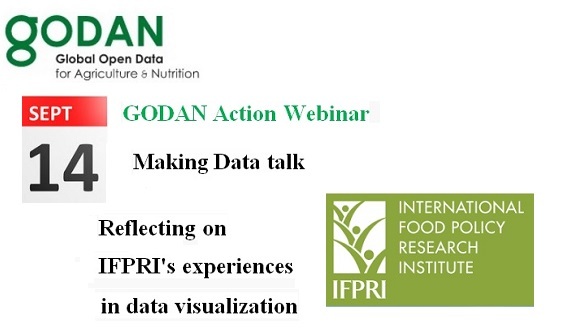 The GODAN Capacity Development WG is pleased to invite you to its next GODAN Action Webinar on “Making data talk: Reflecting on IFPRI's experiences in data visualization” on September 14th 2017 (Thursday) 3:00 PM - 4:00 PM BST. Register for the webinar HERE. In this webinar, The International Food Policy Research Institute (IFPRI)* will share some examples of its data-visualization work from a variety of projects, the associated stories, and what they learned during the process. (3) How they track the usage/impact of data visualizations. This will be followed by a discussion on their experiences using the data value chain to update their data visualizations and reduce maintenance and labour costs. At the end, webinar participants will be invited to interact in a live Q&A discussion segment on data visualisation. * The International Food Policy Research Institute (IFPRI) provides research-based policy solutions to sustainably reduce poverty and end hunger and malnutrition in developing countries. IFPRI research produces primary datasets at the household, institutional, and country levels; countrywide social-accounting matrices; country, regional, and global spatial datasets; and value-added secondary datasets. These are all openly accessible. Yet making data and knowledge products open access alone will not ensure that IFPRI reaches all our intended audiences. IFPRI communicates data and translate information in ways that are audience-friendly—for example, through data visualization and infographics. Such approaches are gaining more prominence at IFPRI and beyond. The GODAN webinars will be recoded and made available for the benefit of the wider community. The GODAN previous webinars are HERE.